FREE Next Day UK Delivery, Valid UK Warranty & UK Plug! Free Next Day UK Delivery will be sent by Parcel Force and applies to the UK MAINLAND only (excluding weekends and bank holidays. Also excludes the Channel Islands, IOM and Northern Ireland). Free Next Day Delivery will be automatically selected at checkout. 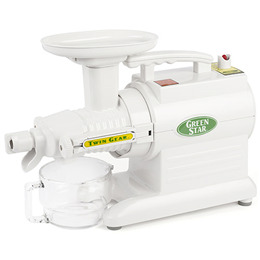 The Tribest Green Star 2000 Juicer uses twin gears to crush the produce and expel the juice. These twin gears are made of stainless steel with plastic ends and are patented as they contain magnets and bioceramic materials in them. These magnets and bioceramic materials are said to extract higher levels of minerals out of the produce and also give fresher juice that`s enzymes and vitamins have a longer shelf life. The fact that the twin gears operate at a very low speed (110 RPM) when compared to many other juicers also helps to considerably slow down the oxidation of nutrients. There is also virtually no or very little heat transfer thus helping in retaining enzyme content. Indeed the technology of the Green Star Juicer`s twin gears enables carrot juice to be stored for up to 2 days in the fridge without significant loss of nutritional value. Exclusive low-speed, quiet and heavy-duty Twin-Gear impeller press system operates with minimal noise, friction and heat, preserving even the most fragile nutrients. Heavy duty Twin Gear Juicing Technology produces higher juice yield and enhances nutritional value of every drop. Automatic pulp ejection for continuous juicing and easier clean-up. Robust plastic design easy to clean using special brush provided. Able to juice virtually anything, including wheatgrass, hard fruits and vegetables. Able to homogenise foods to make sorbets, nut butters, baby foods and more. Below are reviews of Tribest Green Star 2000 Juicer - Twin Gear to Crush by bodykind customers. If you have tried this product we'd love to hear what you think so please leave a review. The Tribest Green Star 2000 Juicer uses twin gears to crush the produce and expel the juice. These twin gears are made of stainless steel with plastic ends giving fresher juice that has a longer shelf life.